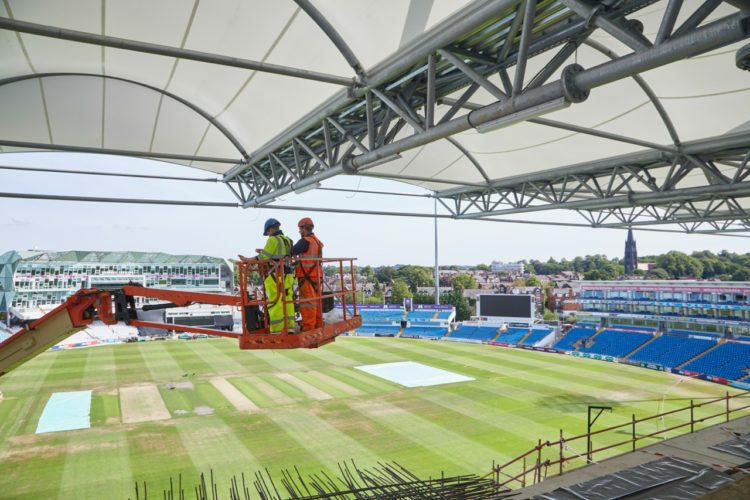 G&H Building Services’ work as part of the transformation of Emerald Headingley’s iconic rugby and cricket stands is continuing at pace with live club and international sport carrying on unabated. 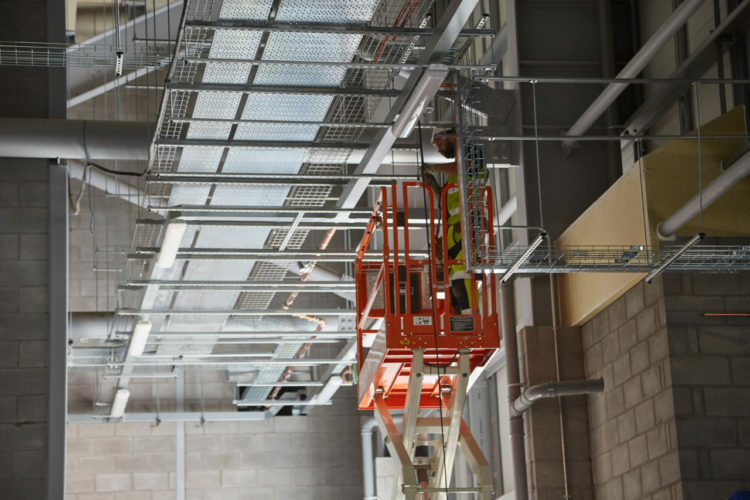 Caddick Construction appointed G&H Building Services in a £5 million contract to deliver the mechanical and electrical design and build as part of the £40 million redevelopment. The scheme is a joint project between Yorkshire County Cricket Club, rugby league side Leeds Rhinos and rugby union side Yorkshire Carnegie. The latest photographs show progress in the rugby South Stand and the combined rugby and cricket North Stand as well as the old cricket pavilion. In the South Stand, lighting in the main stand area is complete closely followed by a PA sound system install. First and second fix M&E works continue in the concourse, which includes bracketing, containment and main pipe runs. All the mechanical plant is in position with the main and sub plantroom installation works ongoing. External water and gas services are already in place ready for utility connections. In the North Stand, containment for the main stand lighting has started from the Western Terrace end to both the rugby and cricket sides and the main build works are on programme ready for G&H to begin in August. The old cricket pavilion is being progressively refurbished now has a fully operational plantroom serving hot and cold water and low pressure hot water heating. 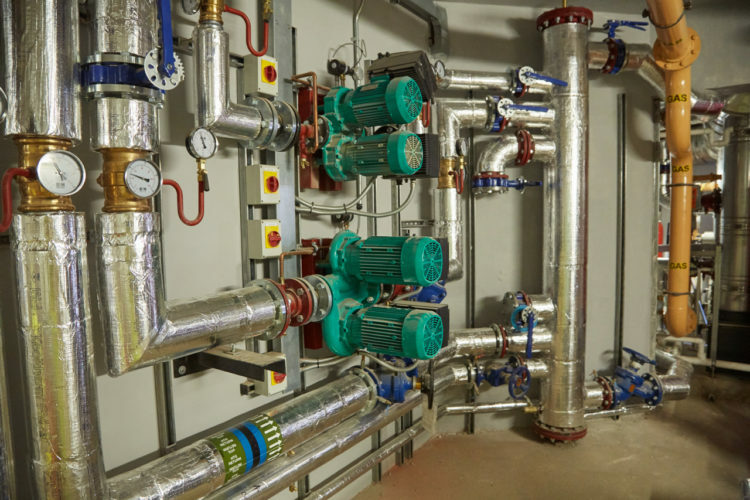 Once completed G&H Building Services will have installed full heating, domestic services, above ground drainage, gas supplies, ventilation, air conditioning and a building management system. Lighting, power, fire alarms, security systems, AV, PA, CCTV, data and door access will also have been delivered. The services are being installed in both the spectator facing parts of the cricket and rugby stands including new banqueting and corporate suites as well as underneath where changing rooms, treatment areas and offices will be situated. Senior Contracts Manager at G&H Building Services, David Wilson, said: “We are delighted with progress in what is a very complex scheme. “Our work has moved on at great pace and we have delivered a large amount all while operating in two live sports stadiums. “The site is incredible busy with both rugby codes – Leeds Rhinos and Yorkshire Carnegie – playing and training and Yorkshire County Cricket Club hosting a lot of domestic fixtures as well as two internationals with a Test match against Pakistan in June and a one-day match against India in July. The new South Stand will have a 7,700 capacity with 2,200 being seated. The new combined rugby and cricket North Stand will seat 4,200 for cricket with 3,800 sitting facing the rugby pitch.